Image posterization is the tranformation of an image with a continuous gradation of tone to several regions of fewer tones, with abrupt changes from one tone to another. The left part of the image shows the posterization effect while the right part shows the normal image. 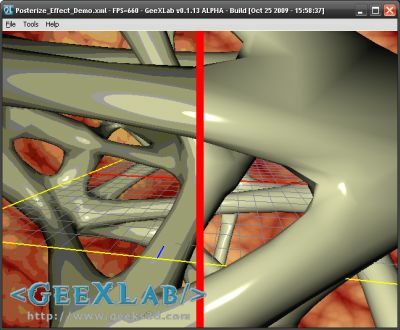 To see the shader in real time, you need GeeXLab 0.1.13. This demo does not use Python so you can use the version of GeeXLab without Python. Unzip the source code somewhere, start GeeXLab and drop the file Posterize_Effect_Demo.xml in GeeXLab. tc = pow(tc, vec3(gamma, gamma, gamma)) ? If so, it’s just for the sake of clarity. is okay on Radeon. Funny! ??? c = pow(c, vec3(gamma.rrr)) ?? ?